The authors teach economics as the study of choice by providing students with an accessible, straightforward overview of economics. This text combines the clarity and writing of Tregarthen's seminal periodical The Margin with great teaching insights. 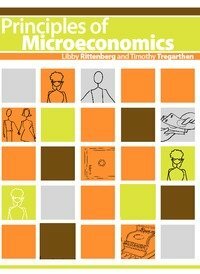 This is an introductory principles of economics course that covers topics in microeconomics. It presents factual material concerning the operation of the firm and household as well as the development of understanding of economic decision-making. In microeconomics, we study the decisions of individual entities, such as households and firms. We also study how households and firms interact with each other. The intended audience is first-year undergraduates taking courses on microeconomics.